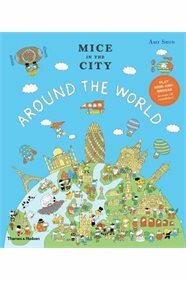 "Join Stanley the Mouse as he sets out on a trip around the world aboard Mrs Crombie's airship! Readers will visit sixteen different locations, including London, Paris, New York, Tokyo, Rio de Janeiro, Beijing, Mexico City, the Great Barrier Reef, Moscow, Rome, Delhi, Namibia's Etosha National Park, Seoul, the Black Forest, Amsterdam and Barcelona. Hidden on every spread is a local food, flag, dress and greeting for children to spot - plus one very naughty black-and-white cat who is prone to all sorts of mischief... Teeming with mice and packed full of iconic monuments, this is a journey children will never forget."